Ten years ago tomorrow the Kursk tragedy took place in Russia. The following 50 minute French produced documentary (see video link below the picture) was initially aired to record audiences in France. 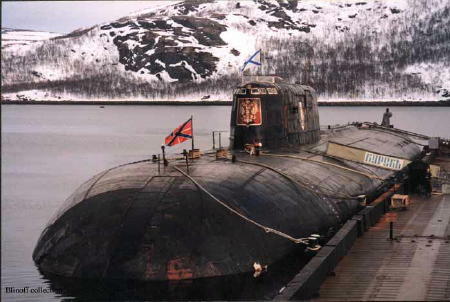 It is believed that the mighty Kursk was not lost as a result of an accidental explosion of one of its on-board torpedoes but rather as a result of a deliberate attack by a US submarine. Regardless of this documentary's accuracy, the content of the film is very interesting. If true, the geopolitical implications of this incident are great. It's easy to see the political reasons behind why Washington would carry out such a risky operation. In my opinion, Washington wanted to show Vladimir Putin, the newly elected nationalist leader and a former KGB man, who was the boss at the time. As far as Washington and its allies were concerned, Vladimir Putin was to have been suppressed at all costs after having begun ousting Western agents in Moscow during the late 1990s. Vladimir Putin may have decided to take the hit because he was in no position to respond at the time. Putin had an immense task ahead of him - to reverse the monumental damages the Russian Federation suffered in the 1990s. His cold calculation to remain silent and continue paying lip service to Washington at the time paid off. Russia gradually rose off of its knees and turned into a superpower again. After the disastrous 1990s Russia is once again the undisputed superpower in Eurasia. A FORMER British military official has backed a sensational claim that the Russian nuclear submarine, the Kursk, was torpedoed by US forces in August 2000. An official inquest concluded that the disaster – in which all 118 crew drowned in the Barents Sea, 135km off the Russian coast – was caused by an accidental explosion of an onboard torpedo. But Maurice Stradling, a former torpedo engineer and a key figure in the original investigation, believes a new French documentary, The Kursk: A Submarine in Troubled Waters, should change world opinion on the sinking. BBC editor Nick Fraser called the claim a "pack of lies" and has refused to air the documentary, which attracted a record audience of more than 4 million when it screened on French TV. The BBC used Mr Stradling as its main authority for a documentary it made in 2001 – What Sank the Kursk?, in which Mr Stradling theorised that the sinking was caused by the malfunctioning of an old-fashioned HTP torpedo. Mr Stradling, who also appears in the new French documentary, said: "At the time (2001), that was a perfectly reasonable film, given the facts as we knew them then, when there seemed to be no third-party involvement,"
The new explanation for the Kursk's downing is based on film footage of a hole in the side of the vessel, and evidence placing US submarines in the area at the time it was sunk. The French film shows stills of the Kursk raised above the water after being salvaged, with a precise circular hole in its right side. The hole clearly bends inwards, consistent with an attack from outside the submarine. A US military source in the documentary declares the hole to be the trademark evidence of an American MK-48 torpedo, which is made to melt cleanly through steel sheet due to a mechanism at its tip that combusts copper. The film suggests the attack happened while two US submarines, the Toledo and Memphis, were shadowing the Kursk in a routine military exercise. The documentary says the Toledo accidentally collided with the Kursk, at which point the Russian submarine opened its torpedo tubes, leading to an attack from the Memphis, which was protecting the damaged Toledo while it retreated. The cause of the sinking was covered up at the time in an act of diplomacy between then US presidents Bill Clinton and Russian President Vladimir Putin – a deal that included the cancellation of $US10 billion ($12.5 billion) of Russian debt, the film states. After the documentary received its only public broadcast in Britain, some claimed the Russian navy had drilled the hole and fed doctored footage to the film-makers to create a false impression.